The Middle East is a mess, from Tunisia to Iraq. But this is worth a try. Syria is enmeshed in civil war (though there’s renewed hope for the Geneva peace conference), Egypt is engaged in violent political strife, and Iraq is blowing up. So, is this the time for talks on the Israel-Palestine conflict? I’d say yes, and I’m willing to suspend disbelief for the moment. It’s easy to dismiss Netanyahu’s comments, since he’s never shown the slightest interest in reaching an accord remotely close to what Palestinians could accept. 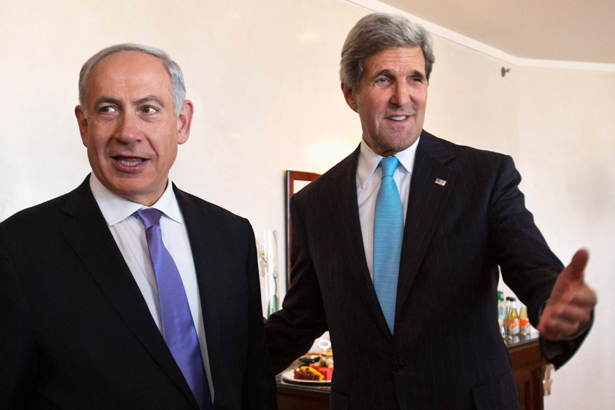 It’s entirely possible that Netanyahu is simply pacifying Secretary of State Kerry, who’s invested enormous amounts of time in shuttling back and forth between the United States and the Middle East to restart talks between the two sides. Undoubtedly, Kerry put great pressure on both President Abbas of the Palestinian Authority and on Netanyahu to get on board, and it could have been difficult for Netanyahu simply to say, “No.” But the fact remains that he said yes, and he’s exposed himself to considerable political criticism from the right in Israel by agreeing to release the prisoners. It’s entirely true that a referendum might doom an agreement, but on the other hand: Why would Netanyahu take the political risk of reaching an agreement which, if defeated in a popular vote, would probably doom his political career and force him to step down? I don’t see the logic of that unless he thinks that an agreement might be reached and that he could then persuade voters to back it. As expected, Kerry has named Martin Indyk to represent the United States in the talks—which, incidentally, are designed to last at least six months, with Kerry getting a commitment from both sides to stay engaged for that long. As I wrote recently, it’s not encouraging that Indyk, who three decades ago served as an official of the American Israel Public Affairs Committee and who’s always been as strongly tilted toward Israel’s point of view and served as the US ambassador to Israel, will run the talks. On the other hand, there is a legitimate view that making use of Indyk will help Netanyahu argue at home that Israel has American support. Fact is, the only way that the talks can succeed is if President Obama and the rest of the administration interferes, overtly and covertly, in Israeli politics—just as Netanyahu, in 2012, interfered in US politics by backing Mitt Romney. As David Mack of the Middle East Institute once explained to me, if and when the United States brought to bear all of its political operatives, former diplomats and military officials with connections inside Israel, it can have considerable effect on that tiny country’s politics. That doesn’t mean, necessarily, making threats to cut off American aid to Israel (which could never get through Congress). But it does mean using people such as Indyk and, yes, even Dennis Ross (and dozens of others) to reinforce pro-negotiations factions inside the Israel political system and deliver stern talkings-to to those who oppose a settlement. I’m not sure that I believe that the Obama administration is capable or orchestrating something that clever or complex. Although Netanyahu is deeply reluctant to cede territory colonised by Israel over the past 46 years, he recently said that one of his goals in the talks was “preventing the creation of a bi-national state between the Jordan River and the Mediterranean Sea”. That, as has repeatedly pointed out, would lead either to the end of Israel as a “Jewish state” or to an apartheid-like regime in which Palestinians were denied equal rights. Netanyahu may have concluded that giving up some of the territory captured by Israel in 1967 is a preferable option. There’s plenty of reason to be skeptical, if only because, well, they’ve tried this before. Stay tuned. Samantha Power’s confirmation illuminates why US policy towards Israel may doom peace talks before they begin.